This Allen point was found by archaeologist Dr. Jack Hofman on 9-1-96 on a bison kill site in western Kansas that was currently being excavated. It was found after recent rains had washed it to the surface. This Allen point is exceptionally well made. It's very thin and is made with oblique parallel pressure flaking. This example is made of a dark purple chert of good quality. It measures 3 7/8 inches long and 1 1/4 inches wide. Allen points were named by William Mully in 1959. William Mully also excavated the type site. He named the points he found there after Jimmy Allen who discovered this site and also the Horner site. The Jimmy Allen site is located on the north flank of a boulder ridge about sixteen miles south of Laramie, Wyoming. The excavation of the Jimmy Allen site produced fragments of extinct bison bones (Bison occidentalis) and 30 Allen points that ranged from nearly complete examples to tiny fragments. The Jimmy Allen site is believed to be a bison kill site. Examples of end-scrapers and side-scrapers were also found on this site which suggests that these people may have camped there and-or processed the hide and meat. The points found on the Jimmy Allen site were made of quartzite. Although this is not the easiest material to flake, these points were extremely well made. Allen points are the same as Dalton points in outline. They have concave bases with either slightly excurvated blade edges, fairly parallel blade edges or a more triangular shape. The pressure flaking is of the highest skill level and their most diagnostic trait is the oblique parallel pressure flaking. Allen points are found west of the Mississippi River to the Rocky Mountains and from Canada to New Mexico. 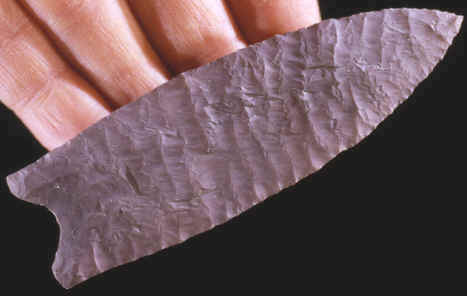 These lanceolate spear points date to the Late-Paleo to the Early Archaic Period. Estimated dates for Allen points range sometime between 10,000 to 9,500 years ago. These points are now generally know as Allen points but in years past they were called Yuma points, Oblique Yuma points, Yuma Folsom points, Colorado points, Jimmy Allen points and Browns Valley points! 1957, H.M Wormington, "Ancient Man In North America" pp144-146. 1985, Perino, Gregory, "Selected Preforms, Points and Knives of the North American Indians vol. 1", pp 332-333.